Additionally, key partners for this year's show were announced including Food for the Hungry, Official Humanitarian Partner; Cantinas Ranch, Nominee Lunch Partner; Kia Motors, Dove Cares Red Carpet and HearitFirst.com, Technology Partner. Hearitfirst.com will live stream the red carpet, pre-telecast and other non-broadcast show activities. “Congratulations to all the nominees of the 44th Annual GMA Dove Awards,” said Jackie Patillo, executive director of the Gospel Music Association. “The Doves celebrate the impact of all genres of Gospel music, recognizing talent, ministry and outstanding performances. The excitement and energy of the Dove Awards show is something we all look forward to – and this year will prove to be better than ever. “We appreciate Lipscomb University hosting our awards, especially as we bring the show back to Music City. It is also an honor to have Mayor Dean be a part of today’s celebration,” continued Patillo. Out of 42 categories, nominees in 22 of the categories were announced today in Nashville, Tennessee where such dignitaries as Nashville Mayor Karl Dean, Lipscomb University President L. Randolph Lowery, and Nashville’s Convention and Visitor’s Bureau President Butch Spyridon and numerous GMA board members were in attendance. The press conference was hosted by a formidable list of Dove and GRAMMY nominees and past winners including Francesca Battistelli, Jason Crabb, Dailey and Vincent, James Fortune, Mandisa, Rhett Walker, Tenth Avenue North, Lady Shaunte of 760AM The Gospel, Les Butler of Solid Gospel 105FM, Nashville’s 94FM The Fish Doug Griffin and Jaci Velasquez as well as other industry leaders. The GMA Dove Awards, Gospel music’s biggest night of the year, will feature artists from every style of Gospel/Christian music coming together to celebrate the impact of its music. 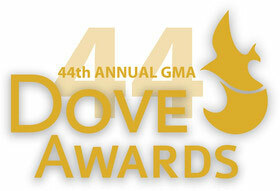 The 44th Annual GMA Dove Awards will be held on Tuesday, October 15, 2013 at 8:30 p.m. EST with red carpet reception ceremonies starting at 6:30 p.m. EST at Lipscomb University’s Allen Arena in Nashville, Tennessee. The evening will be full of rare and exciting performances showcasing the genre’s hottest, most diverse artists and televised live nationwide exclusively on UP TV. Salem Communications’ Nashville-based print and radio media outlets (including CCM Magazine, 94FM The Fish and Today's Christian Music) will offer an unprecedented look inside the Dove Awards, enabling fans a special view inside the industry’s most celebrated event. "We are thrilled to be a partner with the GMA in the 44th Annual GMA Dove Awards and will provide exclusive content across our Christian music networks, publications and Nashville-based radio station. The fans will be able to follow the week of activity and special behind-the-scenes moments like never before” said Michael Miller, Vice President and General Manager of Salem Publishing, Nashville's 94FM the Fish and Salem Music Network. “We are deeply rooted in Christ-centered and positive content, always striving to provide a close connection to the artists for the fans. Heartifirst.com is honored to once again partner with the GMA to bring real-time content directly to the fans during the industry’s most treasured event" says Hearitfirst.com General Partner James Ackerman. Dove Awards will be handed out in 42 categories. The Dove Award nominations go to recordings released during the eligibility period of November 1, 2011through April 30, 2013 and voted on by the members of the GMA. The complete list of nominations is available at www.doveawardsvoting.com/nominees. This year’s press conference was streamed live on www.hearitfirst.com. Tickets to the 44th Annual GMA Dove Awards are now on sale at the Allen Arena box office in Nashville or at www.ticketsnashville.com. Ticket prices range from $15.00 to $200.00. About GMA: Founded in 1964, the Gospel Music Association serves as the face and voice for the Gospel/Christian music community and is dedicated to exposing, promoting and celebrating the Gospel through music of all styles including Pop, Rock, Praise & Worship, Urban Gospel, R&B, Hip Hop, Southern Gospel, Bluegrass, Country and more. The GMA community includes agents, artists, church leaders, managers, promoters, radio personnel, record company executives, retailers, songwriters and other industry visionaries. The GMA produces the GMA Dove Awards and IMMERSE. For more on supporting the GMA or becoming a member, please visit www.gospelmusic.org or contact the GMA directly at 615.277.1376. About UP Television Network: UP, ( www.UPtv.com) based in Atlanta, is America’s favorite network for uplifting family entertainment. The network presents original and acquired movies, series, stage plays and music specials along with gMovies, the first faith-friendly streaming movie service. The UP brand is reflected in “Uplift Someone,” the network’s successful pro-social initiative. UP can be seen in more than 61 million homes on major cable systems including Comcast, Time Warner Cable, Cox Communications and Charter Communications, as well as DIRECTV on channel 338, DISH Network on channel 188, and Verizon FiOS on channel 224. Follow UP on Facebook & Twitter http://facebook.com/UPtv & @UPtv. Salem Communications is America’s leading radio broadcaster, Internet content provider, and magazine and book publisher targeting audiences interested in Christian and family-themed content and conservative values. CCM Magazine has been the hallmark publication of Christian music since 1978, offering exclusive, in-depth coverage of Christian music news and entertainment. In addition to its radio properties, Salem owns Salem Radio Network, which syndicates talk, news and music programming to approximately 2,400 affiliates; Salem Radio Representatives, a national radio advertising sales force; Salem Web Network, a leading Internet provider of Christian content and online streaming; and Salem Publishing, a leading publisher of Christian themed magazines. Salem owns and operates 99 radio stations, with 61 stations in the nation’s top 25 markets—and 30 in the top 10. Each of our radio properties has a full portfolio of broadcast and digital marketing opportunities. Founded in 1971, Food for the Hungry provides emergency relief and long-term development programs in more than 20 countries to help the world's most vulnerable people. Learn more by visiting www.fh.org. Social connections include www.facebook.com/foodforthehungry and www.twitter.com/food4thehungry. Since its inception in 1958, KraftCPAs PLLC has become one of the largest independent certified public accounting firms in Tennessee. Founded by the late Joe Kraft, the firm presently has 16 members and a total staff of over 150 men and women, including approximately 80 CPAs. With offices in Nashville, Columbia and Lebanon the firm provides not only audit, tax, and accounting, but also a broad range of consulting services to help clients build, preserve and transfer business value and personal wealth. Kia Motors America is the marketing and distribution arm of Kia Motors Corporation in Seoul, South Korea. KMA offers a complete line of vehicles through more than 765 dealers throughout the United States and serves as the “Official Automotive Partner” of the NBA. In 2012, KMA recorded its best-ever annual sales total and gained U.S. market share for the 18th consecutive year. Kia is poised to continue its momentum and will continue to build the brand through design innovation, quality, value, advanced safety features and new technologies. Information about Kia Motors America and its full vehicle line-up is available at its website - www.kia.com. For media information, including photography, visit www.kiamedia.com. To receive custom email notifications for press releases the moment they are published, subscribe at http://kiamedia.com/us/en/newsalert. Nashville’s Gospel station has been on the air for over 12 years. WENO strives to encompass the total and complete sound of gospel. Showcasing the best in music, ministry and empowerment segments designed to provide our listeners with information and resources for a healthy lifestyle spiritually, financially and physically. It seeks to provide listeners with the edification of true gospel and inspiration on a daily basis. Hear It First is the leading site dedicated to connecting fans with great Christ-centered and family-friendly content. In music, books, TV and film, Hear It First strives to provide a close and direct connection to the artists, bands, authors and content creators. WE endeavor to keep you up to date with the latest in music releases, concert tours, new books, movies and other TV and video content. We enable artists to share their social media feeds, latest videos, tour dates and downloads.